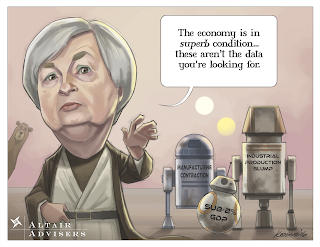 Here's the freshest financial comic for Investing.com you're likely to read this week! 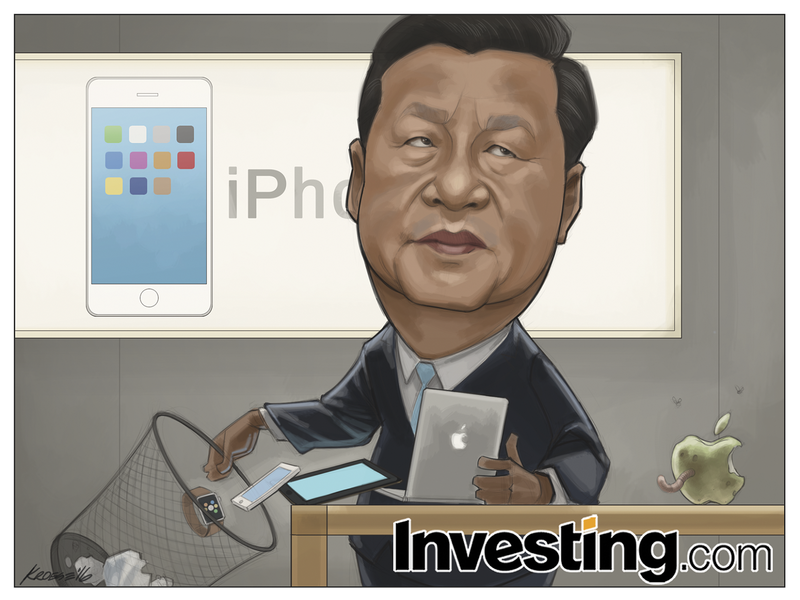 This time around, the subject is Apple earnings, which fell short of analyst expectations, likely due to flagging consumer demand for Apple products in China. 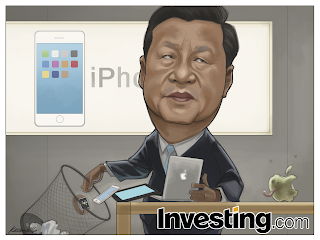 The team at Investing.com asked me to draw China's President Xi Jinping at an Apple store. He was to be standing beside a display table shoving a handful of Apple's primary products into a trashcan. Because there were fewer elements in this comic than in the past few weeks (one character with a fairly straightforward background), I was able to spend a little more time composing this one. 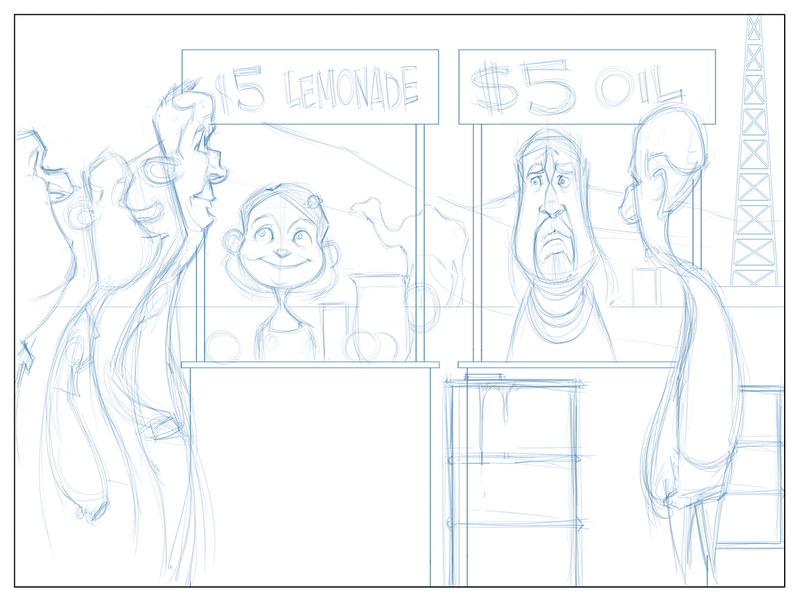 The result is, uncharacteristically, that I actually like the composition of this comic. 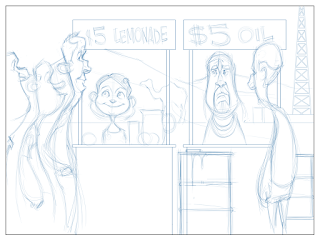 Usually, these comics are such a mad dash that I can't really stop to consider the layout as much as I'd like; it's all I can do to finish it before the proverbial bell rings. 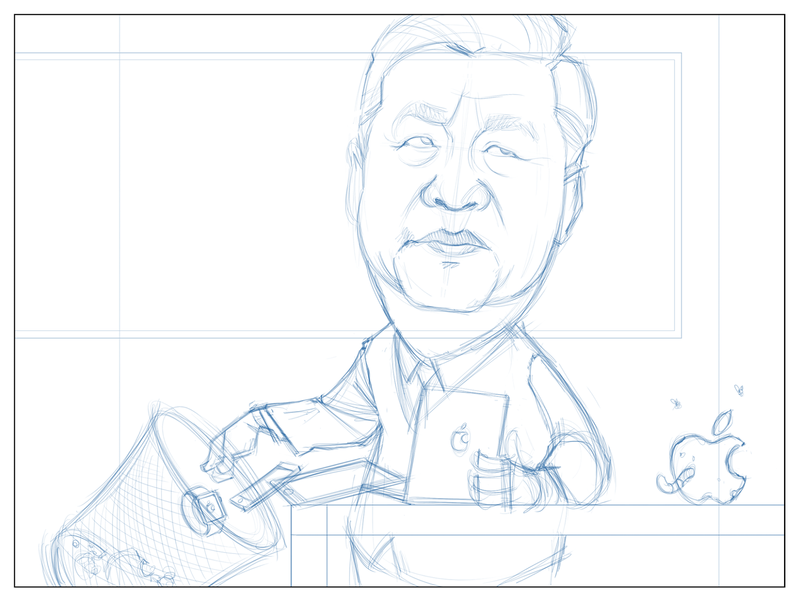 I also tried to give Xi Jinping a bit more expression than usual. 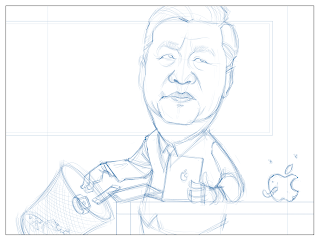 Xi Jinping has a fairly inscrutable face. At least in photos, I've rarely seen him have much of any kind of expression at all. Like Putin, I think it actually makes his face even more expressive somehow. But this time around, I thought I'd draw him rolling his eyes, which maybe has never happened ever. Overall, this one was all kinds of fun to draw. Like that scene in "The Revenant", except with gloabl markets. 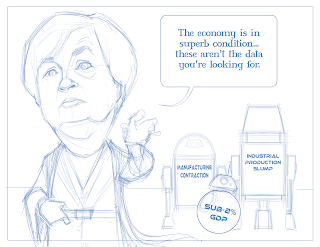 Here's the latest financial comic for Investing.com. 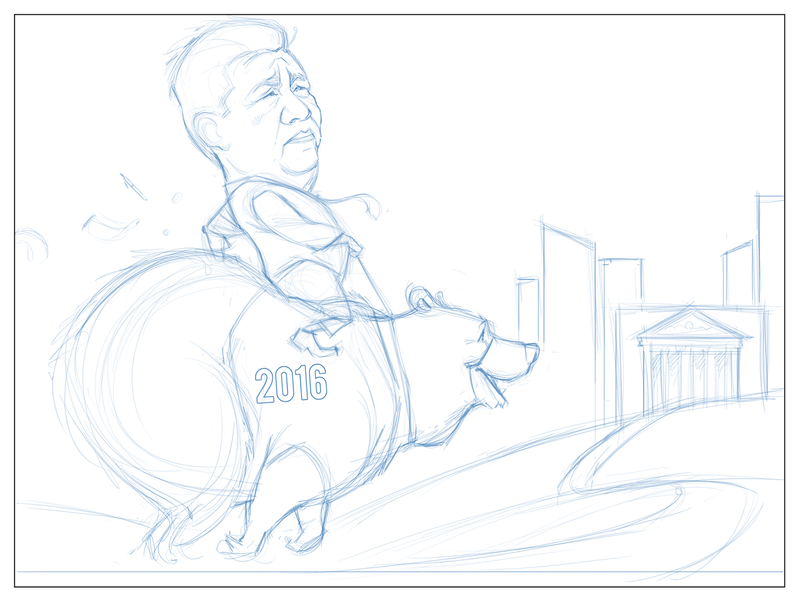 This week's subject is another installment in the bear market series (see also: Xi Jinping riding a bear toward Wall Street). 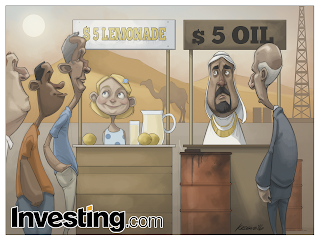 Stocks continue their downward trend due at least in part to sliding oil prices and softening foreign markets. 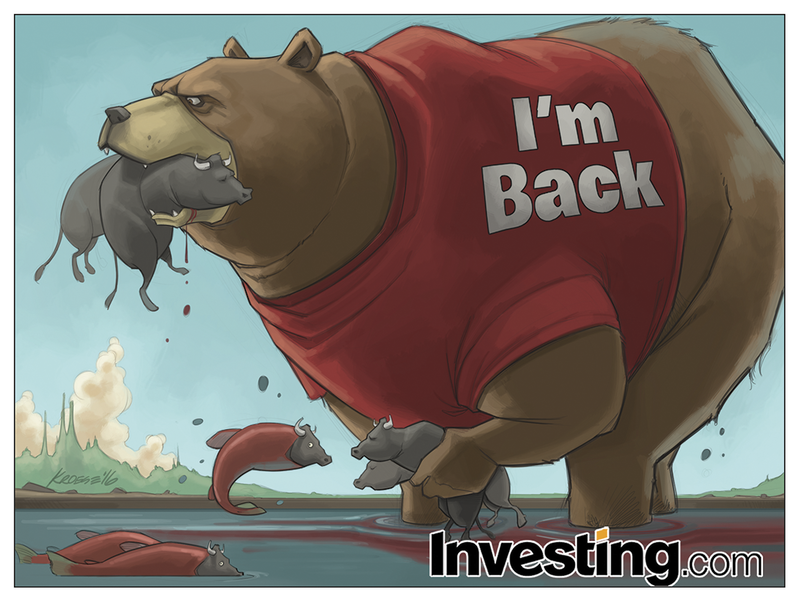 For this week's comic, the team at Investing.com asked me to draw a massive bear in a river eating bulls. 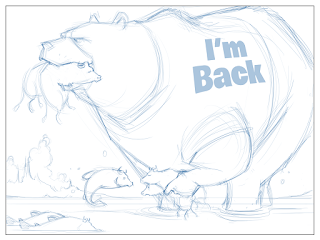 They asked that the bear be wearing a shirt reading "I'm Back". In addition to that, they asked for multiple bulls to be in the bear's mouth, paw, and swimming in the river. Finally, they also wanted the water to show signs of the metaphorical carnage. I have mixed feelings about this comic. Overall, I think it turned out well enough. But I also think I should have done a better job. Bears are usually easy and fun for me to draw, but for some reason I had a bit of trouble this time around. I've also been experimenting with more dramatic lighting and I think the results in this comic are, again, mixed. Could have been better. For years I've pretty much only been drawing these comics with a light source that's directly overhead (mostly for the sake of time and my own sanity). But now I'm getting more interested in the drama and weight you can add just by changing the light source. In this case, I think it was a good try, but it fell a bit short. But it's a start, anyway. Overall, I'd give this comic two cherries and a bar. 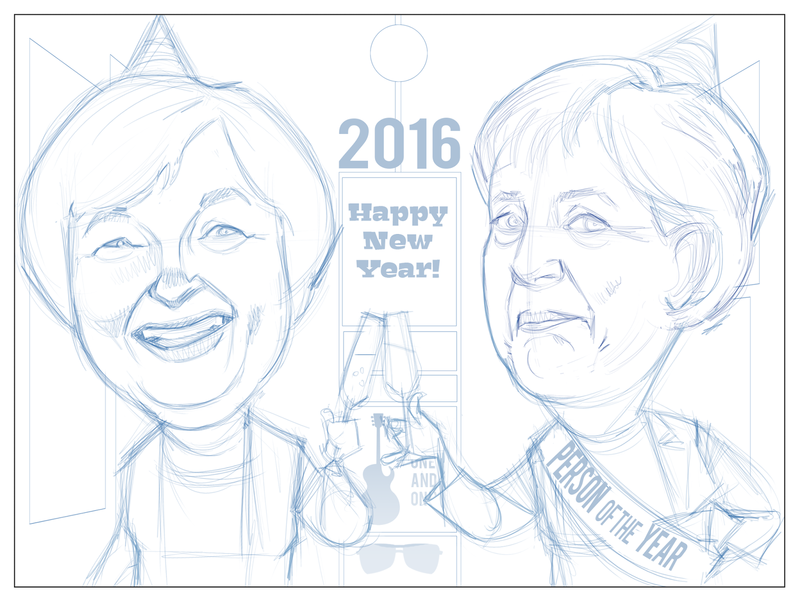 Here's the first comic of 2016 for Investing.com. 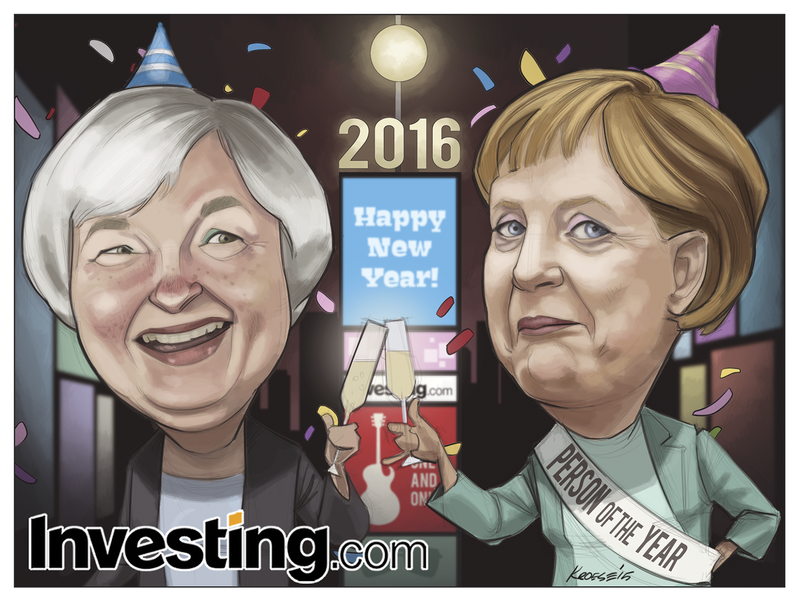 This week's subject is the initial plunge in world markets on the first day of trading in 2016. Stocks traded sharply lower based ostensibly on slowed growth projections in China and on low oil prices. 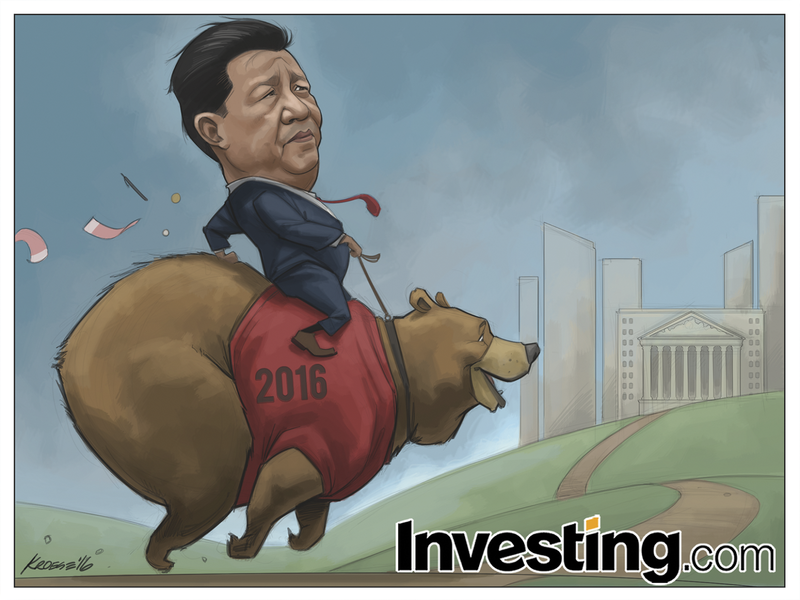 The good folks at Investing.com asked me to draw Chinese President Xi Jinping riding a bear towards the New York Stock Exchange building. The bear was to be wearing a red shirt that read "2016" and a big grin. Xi Jinping was to be wearing a sober suit and sober expression, having lost control of his mount. Fun comic this week. The subject was fun (I mean, Xi Jinping riding a happy bear? SWEET.). It was also fairly straightforward. Because it was just two characters and a fairly simple background (as opposed to a multiple-character comic where I have to scramble from start to finish), I got to spend more time on shading and color choice. I thought a moody sky, possibly just pre-storm would look good and fit the bill for the subject. 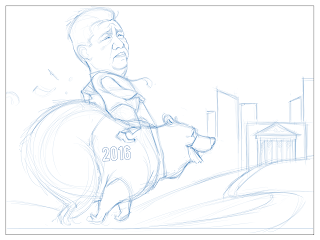 I also had a great time not only drawing Xi Jinping and the bear, but coloring and shading them. I'm still having fun with the more "painterly" technique. Me thinks I'll keep going with it. Maybe it's just too early in the game. But I thought I'd ask you just the same. 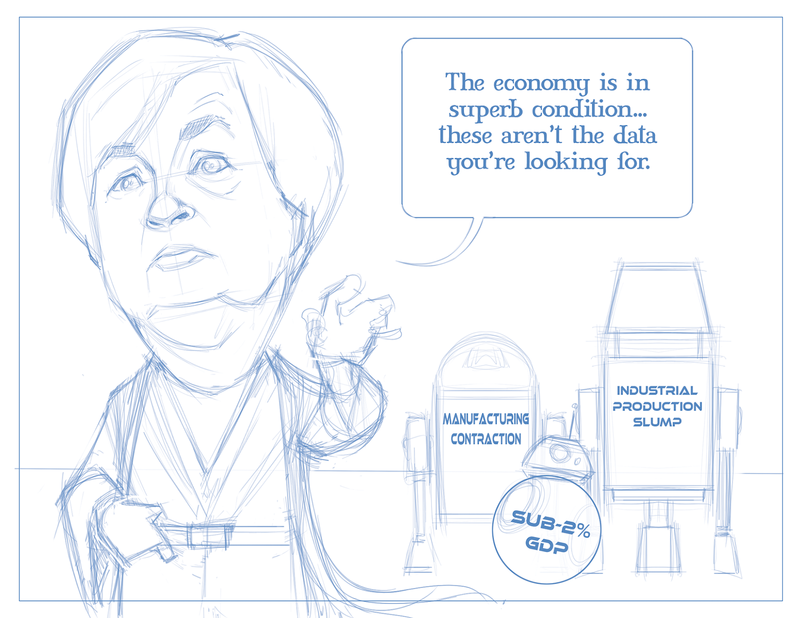 This week's subject is sort of a general-theme reprise of a comic I drew for Investing.com in August of 2014. 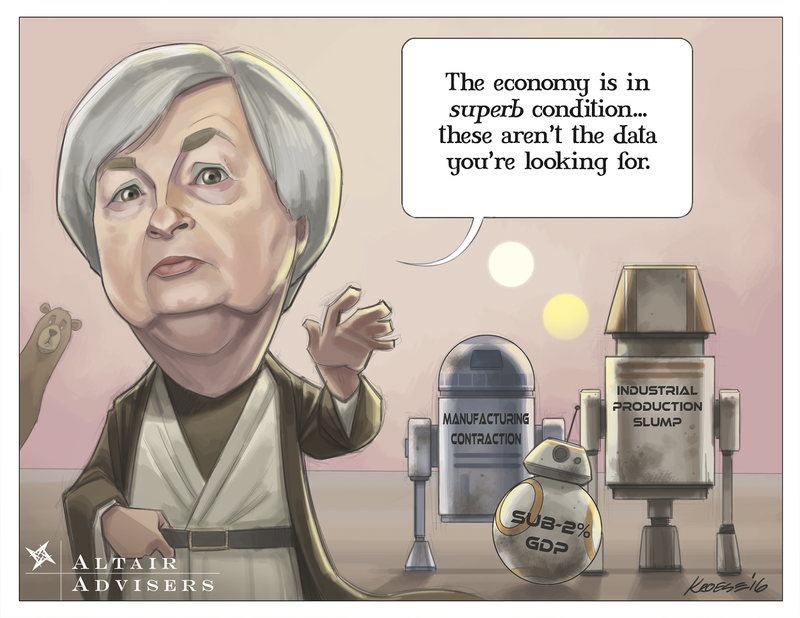 The original featured Janet Yellen and Ben Bernanke and was about the S & P 500 index closing above 2000 for the first time. 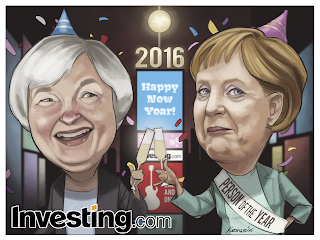 This time around, the crew at Investing.com asked me to replace Ben Bernanke with Angela Merkel. 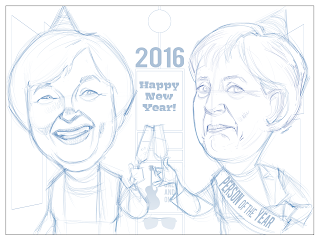 They also asked that Merkel be wearing a sash that read "Person of the Year", in regards to the fact that she is (at least, according to "Time"). Everything else was pretty much the same. Of course, I re-drew all of it anyway. I suppose I could have re-used some or even most of the elements from the original, but I try not to do that too often. I pretty much only resort to re-using a drawing or part of a drawing when I'm super pressed for time. Whelp, that's the last comic for this year. Also, just an FYI: I know I've pretty much only posted Investing.com comics for several weeks now, but I promise I'll post some different work soon. Some of these projects are in progress and some of them I just haven't had the time to share. But they'll be up soon.